For the first time since March, there is a new player holding the #1 spot in the Nevada Online Poker Rankings. Out is Bobby ‘bcm4924’ McLawhorn and in his place is Joe ‘JoeMomasNuts’ Mitchell. 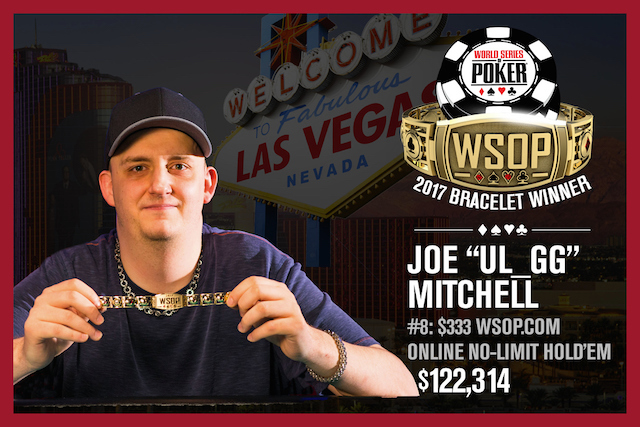 Mitchell won the 2017 $333 World Series of Poker Online bracelet event which earned him 650.69 PLB points and added to his recent finishes in October. Although he did not win a single event, Mitchell’s six podium finishes were enough to get him over the hump to dethrone McLawhorn. McLawhorn now resides in second place after collecting two wins in October to add to his $548,000 in online earnings. McLawhorn’s two October wins are down from his eight wins in September. Moving down from #2 to the three hole is Jed ‘JCHAK’ Hoffman, who made the final table of the World Series of Poker Circuit Main Event in Lake Tahoe. Hoffman collected over $49,000 for his finish, making up for a month of few online results. ‘Power’ chimes in at #4, falling one spot during the last month. Even though ‘Power’ is down, they are not out with four trips to the winner’s circle made during October. Jake ‘Wolf_51’ Didonato is now in the fifth position. Didonato claimed five podium finishes in October and recently saw his career online earnings move past the $100,000 mark. In at #6 is former Nevada #1 Mark ‘wsopfreezer’ Johns. It was an active month for Johns with five victories as he moves up a spot from last month. New to the Nevada rankings is Thomas ‘Butters’ Kearny. The Pot Limit Omaha specialist flexed his tournament muscle in October with six wins combined between October 8 and 11. Overall, Kearney won eight events and has already claimed two more victories in November. Also breaking into the top-10 is Bryan ‘luckboxbryan’ Walter, as he jumps into the eighth position to knock ‘CloverSparkelsFartShovels’ down to nine. Jonathan ‘Jonblvze’ Raber is down to 10th with two more wins added to his career total of 69.